Quick-Hit Thought: Great read for those interested. I'm just a gamer. I don't develop games. I have no grand dreams of magically breaking into the industry. However, there are many developers in the industry who have done just that. 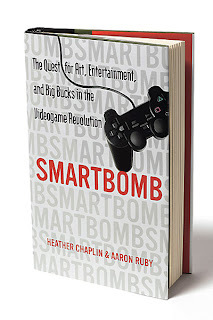 This is a review of the book, Smartbomb : The Quest for Art, Entertainment, and Big Bucks in the Video game Revolution. This is a review from the side of a gamer, of a book about the rock star developers that make my world go. At the heart of Smartbomb is a collection of stories about the rock star developers of the video game industry. The pacing of the book is defined by the first developer we meet, Cliff Blezinski. "CliffyB", as he is known around the offices at Epic Games, is known for his once flashy pimp-like attire, back when he burst onto the scene with the Unreal and Unreal Tournament series. CliffyB is a recurring character in the book. He is considered to be one of the last home-grown programmers who has truly broken into the industry. In a day where developers arrive with college degrees built upon game development, CliffyB is a throwback to such legends as Will Wright of The Sims fame and John Carmack of Doom fame. Wright and Carmack don't have game design degrees, but they have some of the most influential video games in history under their belts. They developed games, because there was no other outlet for their creative talents. However, CliffyB has gone from flashy pimp to laid back front man for Epic. There is a tantalizing connection where we see him at the same parties and conferences as Wright and Carmack. While CliffyB catches the audience's eyes with a new dazzling hair color, Will Wright drops a bomb as he displays his latest effort known, Spore. Wright's presentation ends in a standing ovation. Smartbomb shows us where these visionaries came from. The husband-and-wife team of Heather Chaplin and Aaron Ruby connect many dots amongst a varied background of gaming history. Reading through the book will have you hitting Google for more information on such subjects as the Tech Model Railroad Club of MIT, and the Stupid Fun Club. Their writing style has a dramatic flare that drives the book, and readers will find themselves wanting to know more about the topics covered. However, there are enough new connections and flavors amongst the entwined stories that the reiteration of information is not overwhelming. Also, being a relatively newer book in a growing industry, it serves as a great starting point for the new-age video game historian. The driving point, the reader will know more about gaming and where gaming is headed after reading this book. It is very interesting that most of the gaming scene was covered. At one point, you're in the “gaming room” of an Anarchy Online addict before you are whisked away to the sweltering hotel basement in Dallas, where the latest Cyberathlete Professional League tournament is underway. Smartbomb drags you into the rock star life of the game development industry and then firmly plants you back with the core of the industry: the gamers themselves. Update: 2 Apr, 2007 - Edited labels and article. Update: 28 July, 2008 - Added info section. Update: 15 Dec, 2009 - Reposted to new Heartless_ Gamer Reviews.